I received the Black Powder rulebook the other day, it is quite nice and has a nice peninsular scenario. It always puzzles me that battalion level rulesets (each side having no more than a corps with the basic maneuver element a battalion) appear to be the most popular, but at the same time there are few scenario books out there for this level of action. Especially lacking are scenarios for the peninsula. The Perry brothers designed this scenario for the book. They say it has parallels in the Battle of Corunna, which made it immediately attractive to me. They have played it out on a 12x6 foot table, mine is 12x5 so I think I will be ok. I need a break from painting, so I think I will play a game, also need to use my terrain as well. I will use Field of Battle rules. The movement distance is much smaller in FoB than in the BP rules, but I suspect I will be ok. 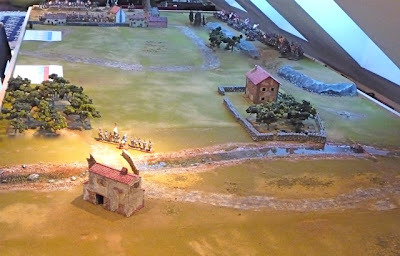 The basic scenario involves a small British force being pursued by a larger French force. 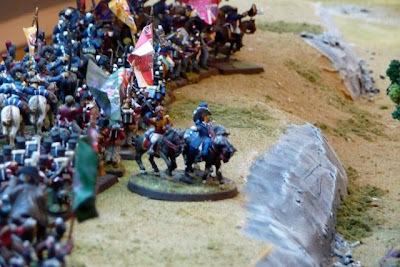 To win the game the British force has to get over the bridge to the village of Valdelacasa. The larger French force starts the game in the town of Valdeverja. A single French battalion is garrisoned just south of the bridge to Valdelacasa. If the British can get 60% their units over the bridge in a four moves then they will win the game. For the fun of it, I changed the fictional town names to real places, so although the battle is fictional, the locale will be real. 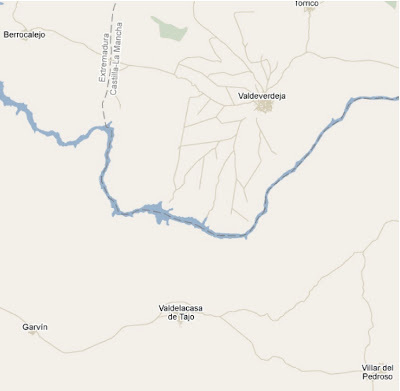 The places and river exist in the Salamanca province of Spain. I suspect some of you will recognise the village of Valdelacasa, as it is the place of the first battle in Sharpe's Eagle. I do not think I will have Lt. Colonel Sir Henry Simmerson to lead the British though, as they would never have a chance to win. I had most of the figures required for the scenario so had to make few substitutions. I use the random generator on the FoB Yahoo group site to assign combat and defense values to each unit. Here is the British Order of Battle, these units all served in the Peninsular wars, mostly in the Light and Third divisions. I will make Wellington CinC. Here is the French OB, most of these units were in the French Army of Portugal; 6th corps, aside from the Guard Lancers, I need to paint more cavalry. I will make Marshall Ney the French CinC. Fortunately, I had terrain pieces already made that would work for the scenario. I made Valdeverja a walled town with stones walls to the south. It is a large garrison town for the French Army of Portugal. All units can move freely within footprint of the town and out of the town without movement penalties. As you will note the town is in 2 levels with the French infantry brigades in the upper level. The Anglo-British army is coming from the east along a ridge. The ridge is accessible from the extreme north and along it's western edge at one point only. No movement penalties are associated with the 2 access points. 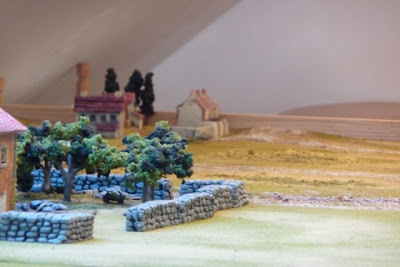 There is a large walled farm north of the river, which can hold a maximum of 2 infantry battalions. The river is uncrossable, except at the bridge. The forests are all impregnable. They act to obscure the eastern ridge so they block artillery and small arms fire in both directions. I elaborate on terrain planning here. Looking south from the town of Valdeverja. Note the northern access point to the ridge. 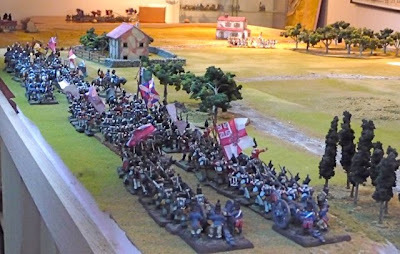 The French can choose to attack the British from behind. Five French brigades, 3 infantry, 1 cavalry and 1 artillery; all in column of march. Four British brigades, 3 infantry and 1 cavalry; all in column of march. The village of Valdelacasa far to the south with the walled farm in the foreground. The bridge over the river with the 26e ligne in defense. The French position looking north to Valdeverja. 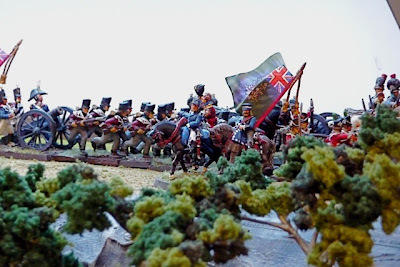 Close up of the 3rd British brigade. Looking to the east at the British Army showing the access point. The British have the first move in this scenario. Now all is left to do is to decide the tactics for each side and start the game. All terrain is class I, the forests, the river and the ridge line are all impassable, except at the grassed slopes of the ridge and the bridge which are class I terrain. The walled farm is 2 town sections, thus can hold 2 battalions. The town of Valdeverja is a terrain feature not a town in the sense of FoB. There are no skirmish units. The forests along the ridge line block line of sight. The stone walls are hard cover (Class III) in the town and farm area. The game ends in 4 moves, Army Morale Card failure, or when the British get 60% (12 units) over the bridge to Valelacasa. Die thrown:7IP, British up first per scenario. British Cards: Lu,TA,Lu,AF,Lu,AF,IF; Well that is a pretty boring start. French Cards: IF,Mo,L,TA,Mo,L,AM,Ma; Well some movement anyway. British Cards: IF,Mo,IF,L; The British start their advance. Die thrown:9v9, Turn ends prematurely. Positions at end of turn 1. Took a little longer than I thought to complete Turn 2. Work has really got in the way of having fun, but one good thing about solo wargaming is that you can pick it up whenever it is convenient. I do shift work and have to work every second weekend, so it is hard to organise something with other gamers. Turn 2 was also held up because of debate that arose in my mind over the ability of an infantry unit to test to form opportunity square when being attacked by cavalry. I polled the FoB Yahoo group, after some discussion decide against it. Well it was quite an exciting round, a lot can happen in a single turn in a game where the the moves are decided my card generation. The first action involves the cavalry brigades of each side. 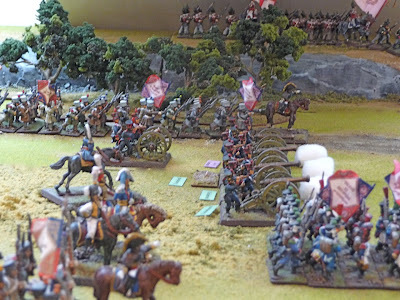 The British Light Dragoons and the KGL Hussars engage the 26e ligne in the rear, they lose 2 UI points and fall back, the Light Dragoons go out of command and pursue. A number of separate cavalry actions ensue and the French get mauled, the 6e Dragoons, 3e Hussars, 15e Chasseurs as well as the HA get destroyed by the British cavalry, the RHA and forward elements of the 3rd Infantry Brigade. The Polish Guard Lancers are routed by the 74th. 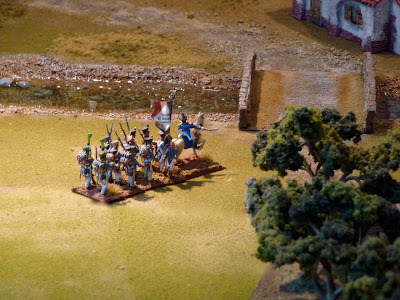 The only Anglo-Portuguese loss is the rout of the 9th Portuguese Line Infantry.The British Infantry Bdes are almost off the ridge. The artillery element of the Light Bde fires down on the 1e infantry Bde moving in column along the road, the 2/69e ligne loses 2 UI. Things are looking good for the British; they have decimated the French cavalry Bde, the sole French unit protecting the bridge, the 26e ligne is being engaged by the KGL Hussars and can not even get into square. The other units of the cavalry bde have turned north to face the oncoming French Infantry and the forward British infantry bde is already at the farm. Looks like the game is over before it has even gone 2 turns. Marshall Ney then makes a daring move. He commands his Artillery Bde to move within 300 yds of the British infantry columns and form into a Grand Battery. He has no infantry support, a very risky move. The French guns unleash a devastating volley at the flank of British 2nd infantry bde. They are destroyed with the only surviving battalion, the 1/5th Regiment of Foot in rout. On one card and some superb dice, he has destroyed 20% of the British forces. 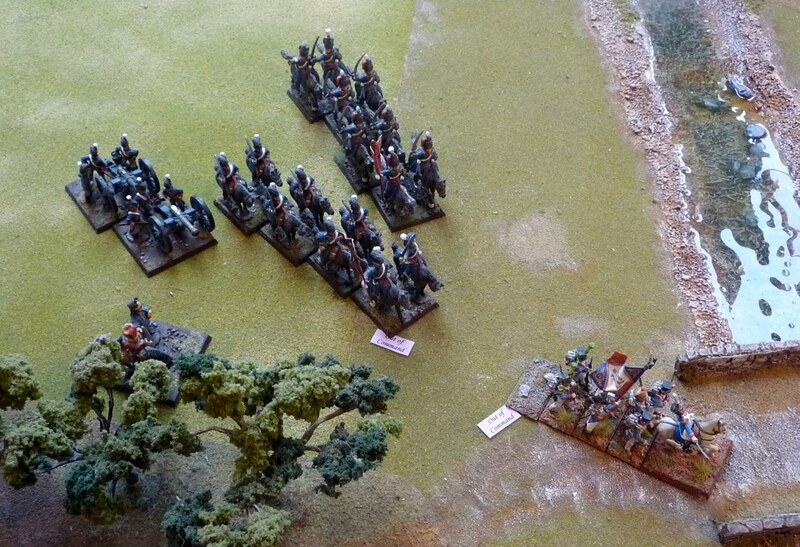 The French infantry start to form into their dreaded attack columns. 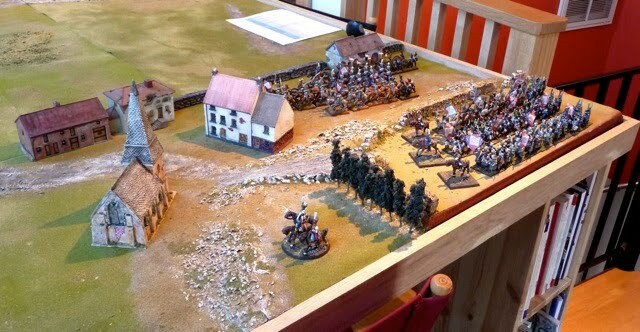 Finally, if that is not enough, the last card of the turn is a Leadership card and the French brigade commanders are able to rally a silenced artillery battery and the Polish Guard Lancers, who immediately about face and make ready to charge elements of the 3rd British infantry brigade!!! Positions at the end of turn 2. Both sides have lost 19 Army Morale points. 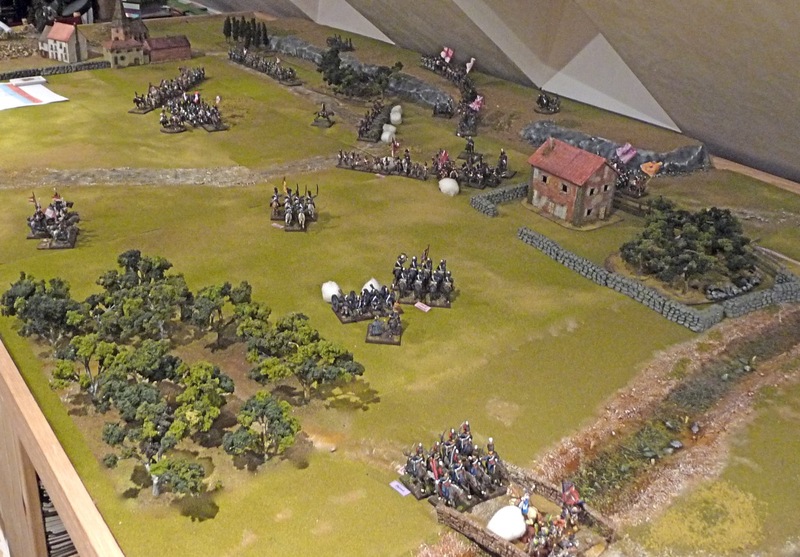 The third turn started with the French starting to rally and move forward. Unfortunately this turn for the British was characterised by extremely poor leadership and poor dice throws; a lethal combination so it appears in FoB. The British consequently could just never cease the initiative. The French Grand Battery of 32 cannon was lethal and their artillery commander was clever enough to place his howitzer behind the grand battery so there was a continuous lob of shrapnel on the columns of British has they came down the ridge. Marshall Ney instructed his generals de brigade to form into the dreaded columns of attack. They engage the British 2nd and light brigades in their flanks causing considerable loss. The British just can not get a maneuver card or throw an even dice, they get stuck in march formation. The 2/52nd, 1/43rd and the 1/95th all get routed off the table, clearly their D10 commander was not Black Bob Crauford. The French cavalry general despite losing 2/3 of his men was able to repeatedly rally his Polish Guard Lancers from rout. The 16th Light Dragoons are routed and the 4th Portuguese Dragoons are routed and destroyed. The British 3rd Brigade manages to make it to the bridge, 2/88th engages the 26e ligne with some success. The 74th and the 9th Portuguese follow closely, the 94th somehow or another get out of square and start to advance to the bridge. Even the 5th, the sole surviving battalion of the 2nd Brigade is rallied from rout and rapidly moves toward Valelacasa. The British and Portuguese foot artillery batteries limber up and start to move slowly forward. 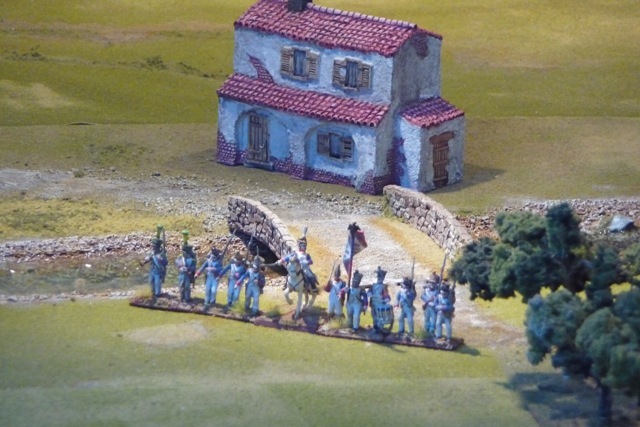 The excellent leadership quality of the French infantry commanders reveals itself when a series of 3 Leadership cards are drawn and they are able to rally multiple UI points for their units, even the weak colonel (D10) of the 26e ligne is able to rally his troops from rout on a D4vsD8 throw!! The turn nears it's end, the British have lost 7 of their 20 units, one more and the game is over. 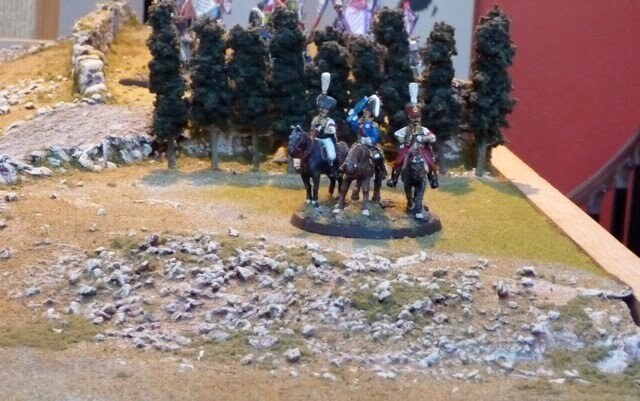 The Light Dragoons are in rout and only the 2/88th is over the bridge. The turn ends. Should I end the game, the situation appears hopeless, the British have been at zero AMP for what seems like forever. Lets throw the dice, maybe they will finally gain the initiative and throw some good dice. D12vsD12. Game over. C'est la vie. I really liked this scenario. It was fun to play and it did seesaw back and forth. It really made me appreciate the Field of Battle ruleset as a solo wargamer, it was impossible to favour one side over the other. If I was going to change something, I would have not used the random generator for FoB to get the Leadership ratings. The British had quite bad Leadership die with 2xD12, 2xD10 and 1 D8. The French had 5 D12 out of 7, I think it made a difference. I will definitely play this scenario again. I buyed 'Lasalle' rulesets from Sam Mustafa. Maybe I 'll use this little scenario to study the rules. 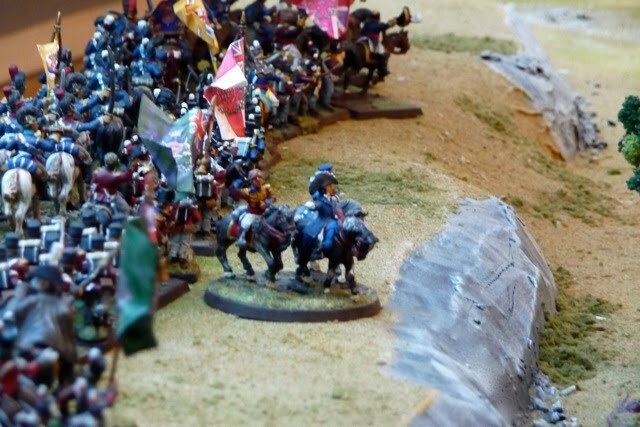 Very interesting report on the Blackpowder rules. The randomness of the dice has both pros and cons with what appears to be a relatively unconstrained rule set. Take your point about the leadership being dictated by what you roll but its been the same with WRG and (mercifully) less so with General De Brigade, both of which I am more familiar with. One of the interesting things by not having army lists and prescribed points values with these rules. Love to try them out. Really like your modular terrain and table BTW and wouldn't mind putting something together like that myself. Thanks Doc, I was actually using Field of Battle (simplified version of Piquet) rules. They are great for solo wargaming. I another post you asked about my terrain. There is a full tutorial on the blog, click on terrain flag to the right and you will get it from start to finish. Thanks Rafa, the scenario gave a great game. I am actually thinking about running it again. That looked like a fun scenario - very well described. Do you think you'll be trying the Black Powder rules anytime soon? I am going to hold off on the BP rules for a while. I like the FoB rules as they are card driven. I may try to do something with Lasalle.